When a language arts teacher in an 8th-grade classroom introduced the new theme of literature circles, she said to the class, “This quarter we will be reading different novels with a central theme on speaking out, and today I will introduce all the books you can choose from.” She wrote this theme on the board and asked several ELLs how to say “speaking out” in their language. Some ELLs used their bilingual dictionaries in negotiating that meaning. This was done in Korean, French and Spanish. The teacher created a web and wrote students’ translations phonetically around the English word, asking the class to repeat after each student. She made references to these words throughout the lesson. Another day, she asked one student to give the word of the day, a daily warm-up activity. She said it could be anything related to the unit they were studying. He said a word in Spanish and proudly instructed the class “Now everyone repeat after me,” but because not everyone did, he raised his voice and repeated the instruction. Then almost everyone did it at the same time. Copyright © 2004 by the National Council of Teachers of English. Posted with permission. Sumaryono, Karen, and Floris Wilma Ortiz. 2004, May. 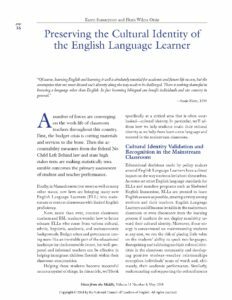 “Preserving the Cultural Identity of the English Language Learner.” Voices from the Middle. 11 (4): 16-19.